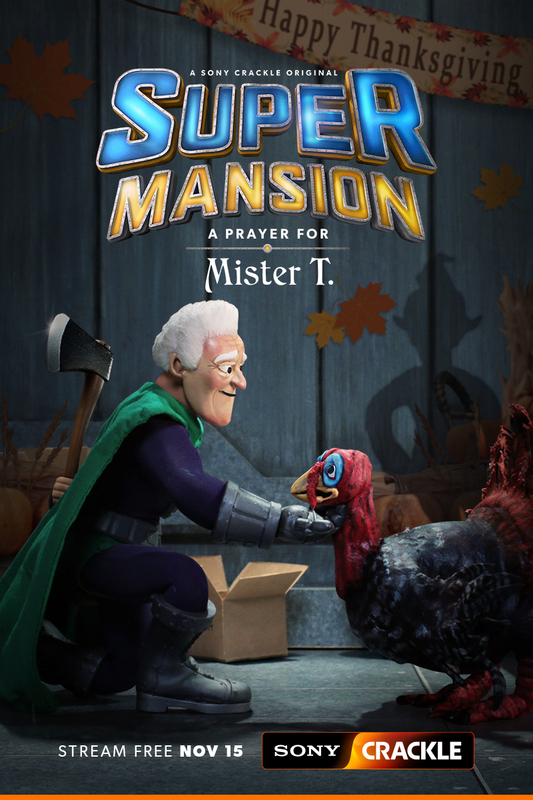 New York, NY, October 4, 2018 – Sony Crackle, the free streaming network, today released at New York Comic Con the official trailer and key art for the “SuperMansion” original holiday special, “A Prayer for Mr. T: The SuperMansion Thanksgiving Special.” Set to debut on Thursday, November 15, the Emmy-nominated series gave a sneak peek to fans as part of a panel with co-creators Zeb Wells and Matthew Senreich, along with voice-acting star Bryan Cranston, who also serves as executive producer, and guest stars Breckin Meyer and Gary Anthony Williams. This marks the fourth special for the stop-motion animated series. In addition, new episodes of season three return today, Thursday, October 4, featuring Oscar® and Emmy®-nominated actress Minnie Driver in a recurring role as Debbie Devizo, Dr. Devizo’s (Chris Pine) ex-wife and former League of Freedom team member.